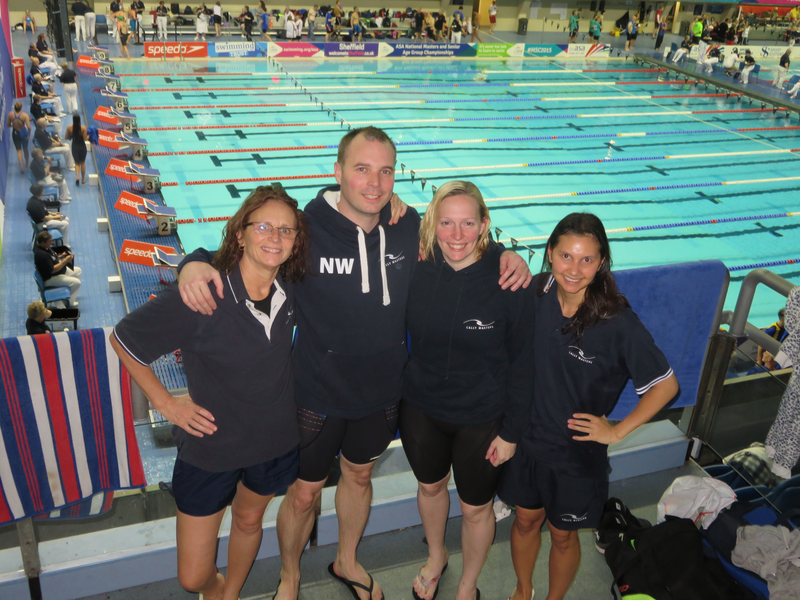 On the weekend of the 23-25th October, a depleted but dedicated team headed up to Sheffield for the 2015 Masters Nationals. The lengths that some underwent to get out of a few races was extraordinary: Luka Crnjakovic arranged a trip to Spain to avoid the Sheffield weather during October and Rebecca Adam literally broke her leg by throwing herself down a bus stairwell to avoid the 100m Fly. This meant that Cally team relays were off the agenda and it was all about individual performance. Sara Perry used the 200m Freestyle and 100m Breaststroke on Friday to stave off her impeding illness and get into the swing of it. Sara wasn’t that happy with her 200m Free (2.46.88) but the first race at Nationals is a bit like making pancakes – the first one never works. In saying that, Sara still managed top 10 for both the Freestyle and Breaststroke (1.36.05). Nick Warren only showed up on Saturday (similar to training really so let’s hope the pool police don’t notice) but did ok with only being 1 second off his best pace in both the 100IM (1.09.94) and 100 Free (59.2) and mid-field for the age group, around 15th. The 100 Fly was a different story: although the overall time and place was around par (1.10.35 – 18th), there is clearly a lot of work to do when the first 50m split was 30% faster than the 2nd 50m – #armsfelloff. More training necessary for that chap. Christine Jaeggi had a much sharper 100m Fly with a 1.13.19 and top 5 finish. Very impressive for her first fly race after baby (FFAB). That left it to Sara to bring it home with the 50m and 200m Breaststroke. And what a performance! The sprint was 43.88 and the 200m 3.23.68. Her 50m was her best of the season and the 200m was only just off this and included a 100m split time that was a second faster than her 100m from the Friday. An honourable mention needs to go out to Natasha Morgan. She has a close affiliation with Cally Masters and you will see her from time to time, although generally swimming down with Southwark club. Natasha knocked out no less than NINE races over the three days. That is more than half of the entire programme and far more dedicated than pretty much anyone else racing up there. Despite the workload, Natasha hauled in some metal as well: she won the 200 Breaststroke (2.49.07), and came third in both the 100 Breaststroke (1.18.95) and 400IM (5.30.75). I didn’t realise it was legal to continue making people swim 400IM; that’s 5 and half minutes you probably never want to experience again. She was in the top 10 for all the other races so quantity went hand-in-hand with a lot of quality. Well done and we would love you racing under the Cally Masters’ banner any day. If anyone is keen to learn a little more about the competition programme at Cally Masters, come and have a chat. We are keen for participation (it is good for club ranking) and Masters comps really are designed for everyone so it’s definitely a case of the-more-the-merrier. This entry was posted in Swimming Club. Bookmark the permalink.